Hi Vanity, so good to see you again. I am glad that things in your life are stabilizing and you can get back to painting. This pony is out of this world: beautiful shiny hair, pose and face..love this picture a lot. Good to see you back Vanity, sorry to hear of all your troubles. 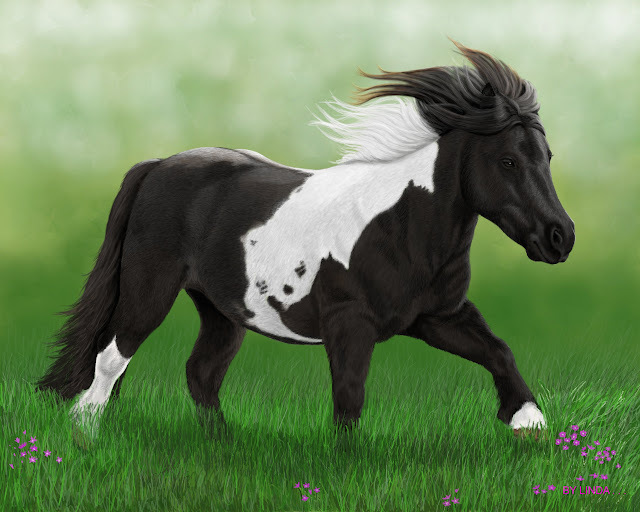 Lovely painting of the pony. Sorry to hear about your run of bad luck...life happens, good to have you back. Beautiful painting !!! Now we actually wish You to enjoy only peace and serenity for the forthcoming two decades period at least, since You seem to have already paid for at least 10 years bad luck in one instalment only! Moreover our expactation is to go on enjoying reasonably often Your wonderful works and real stunners like tghis. Second, I hope you'll find the recent difficulties soon behind you with brighter days ahead for you and yours. Sending you all best thoughts, and hope we see you around more with your good spirits and terrific art. I am so sorry to hear of all your troubles. I hope things keep improving now and getting better Take care.